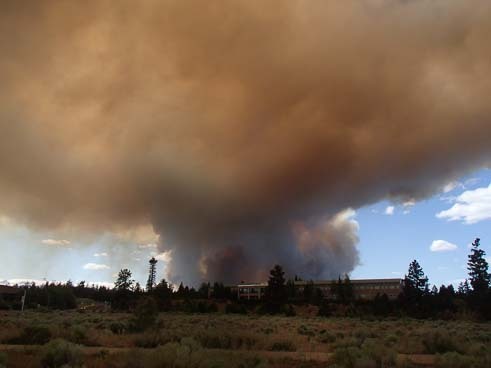 Smoked out by a Wildfire! June, 2014 – We were having so much fun in Bend, Oregon, that one night when we went to bed we joked that we’d probably stick around for another month. 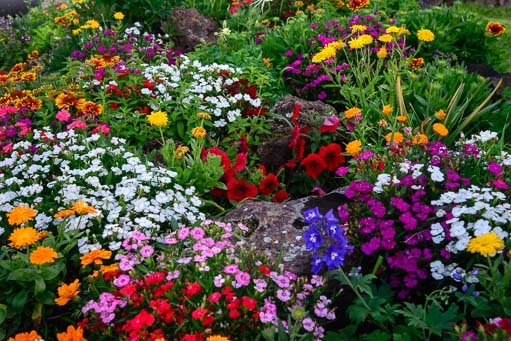 Or maybe all summer! The next afternoon the Two Bulls wildfire broke out about ten or so miles away. 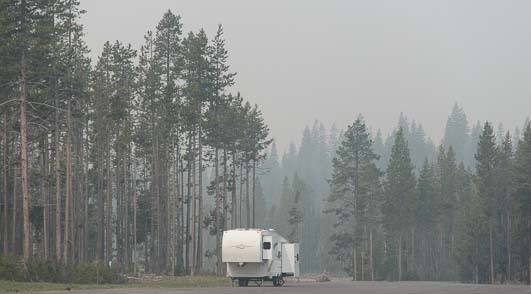 Within 24 hours the smoke was choking our campsite. Ironically, back at Crater Lake, we had stood in the snow on the rooftop of an overlook with some Oregon firefighters who told us they expected a very difficult fire season due to the scant snowfall over the winter. How shocking it was suddenly to find ourselves in the thick of it all! 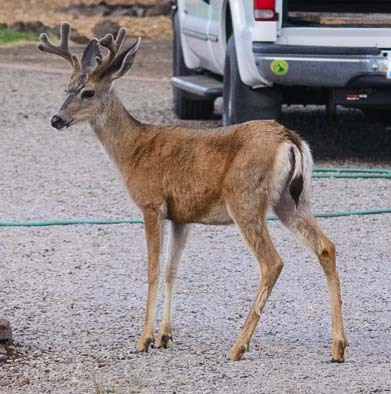 Luckily, our home has legs, so we hightailed it out of there to Terrebonne, 30 miles or so north of Bend. 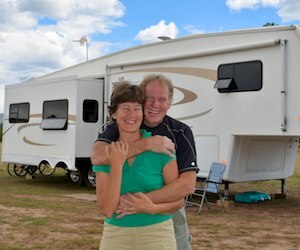 Our search for a boondocking spot was easy, as we had already planned to head that way eventually so we could stay on the property of fellow Escapees RV Club members Bob and Peggy. Five years ago, after reading an article of ours about propane heaters in Escapees Magazine, Bob had emailed me suggesting we come visit them in central Oregon someday. We discovered that they participate in a very unusual Escapees program that sets the club far apart from other RVing organizations. Escapees members who own property can make it available to other members for dry camping, either for an overnight or for a longer stay. The annual Escapees Travel Guide lists the contact info for these generous members. We made all kinds of new friends! There are other programs that do this sort of thing for profit, but Escapees is unique in that the invitation is extended in the spirit of sharing and the program is simply one of many that is offered with the membership. In this case, not only did Bob and Peggy give us a lovely place to call home for a week while we collected our wits after the fire and re-thought our summer plans, but they offered us warmth, hospitality and friendship as well. 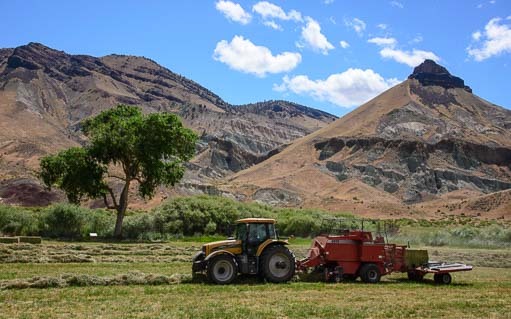 When the buggy’s feet finally got itchy to move on, we headed towards northeastern Oregon, a destination that has been calling us since we first visited the Oregon coast and Columbia River years ago. 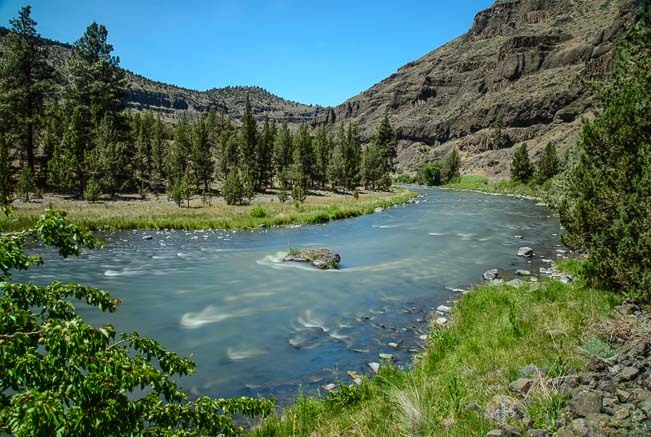 Our first two-day stop was in Prineville, less than an hour’s drive east, where I had noticed an intriguing squiggly road running south (SR-27). 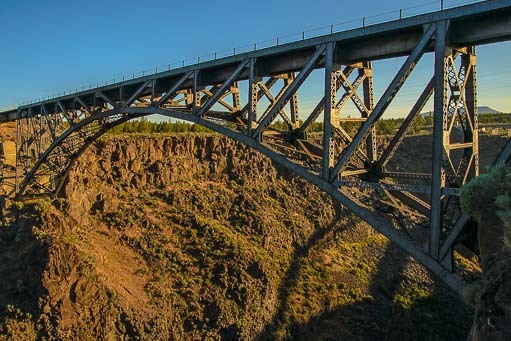 This road took us on a beautiful scenic drive along the banks of the Crooked River. 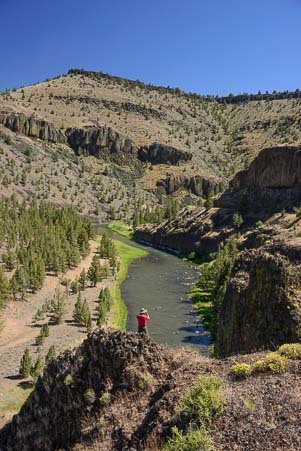 This is the same river that runs through Smith Rock State Park, but here, rather than towering monoliths on either side, the river makes its way between lava beds. 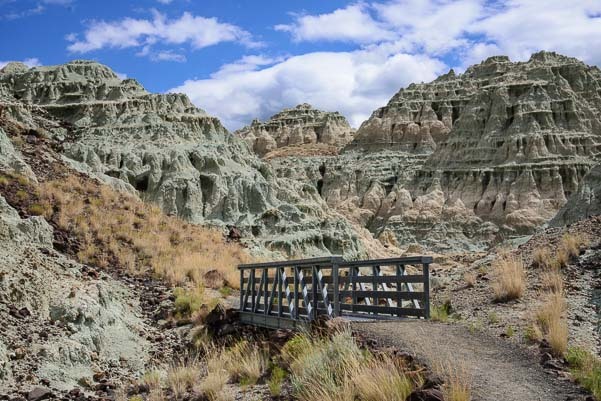 Heading further east, we stopped at two of the three areas that make up the John Day Fossil Beds National Monument. We had looked forward to spending some time roaming around this area after reading about it in depth on the excellent RV blog WheelingIt. However, the daytime temps were becoming stifling and we decided our visit this time would be brief. We took a quick swing through the Painted Hills (and I mean quick — Mark laughed as he drove the buggy at race pace and I hung out the window with the camera!). At the Blue Basin in the Sheep Rock Unit of the Monument we hiked into the strange grey-blue drip castle-like rock formations. Roasting from the heat, though, we finally found respite indoors in the cool house-turned-museum on the former sheep ranching operations that are now part of the Monument. 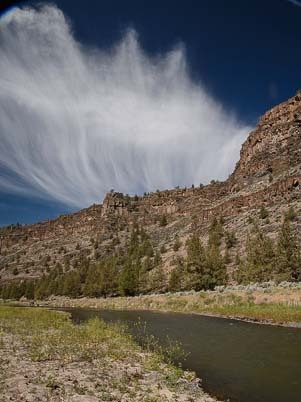 We learned that this whole region of Oregon, some 100+ miles east of Bend, was once a huge sheep ranching area. This ranch house offers a peek into how these enterprising folks lived. The house at the Cant family ranch. Remote even by today’s standards (no internet access for miles! 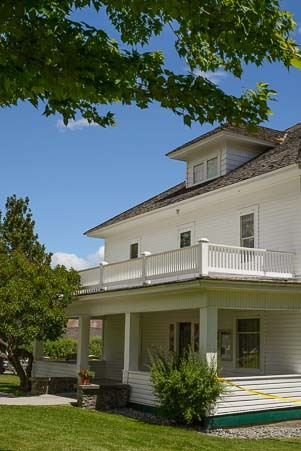 ), it was even more remote in the first half of the 1900’s when this ranch was built on open homestead land. When lambing time and sheep shearing time came around, not only was the rancher busy as the CEO of his operation, overseeing his contract labor in the field and barn for weeks at a time, but his wife was busy as the CEO of her operation too, running a very busy “restaurant” and “rooming house” in her own home! Elizabeth Cant’s kitchen was the only source of cooked food for many miles around, and the workers were hungry. View of the hay fields from the ranch house. The family raised all the meat and grew all the vegetables served at their table, and Elizabeth often served meals in two shifts! There were old rusting tractors in the yard. A harmless snake pokes his head out. 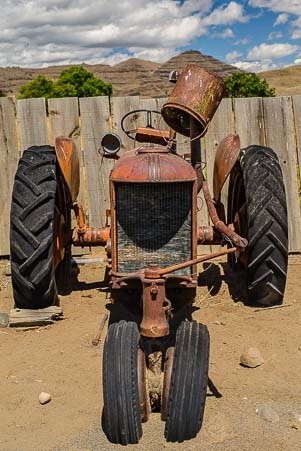 While I was chuckling over these quotes and trying to imagine life in such a different world, Mark had gone back outside to photograph the rusting antique farm equipment in the barnyard. 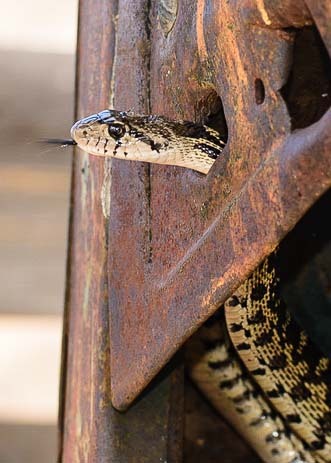 As he studied the interior of one to line up a photo, a snake suddenly emerged from a hole in the dashboard! We will come back to John Day National Monument another time in a cooler season to see more of it. But for now, after this brief introduction, we were ready to get out of the heat. The next day we hitched up the rig again and headed further northeast.